Yeah, sorry about that. Sensible review time! Photosynthesis is a game I immediately fell in love with earlier this year when I picked up a copy during my trip to Airecon. It's a beautifully produced abstract strategy game from Blue Orange, designed by Hjalmar Hach and lovingly illustrated by Sabrina Miramon. 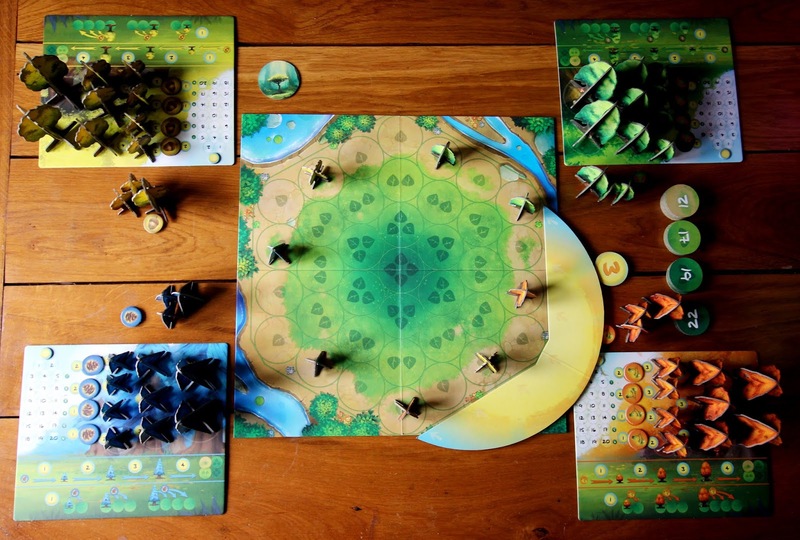 It's also pretty much impossible to have on the table without people coming to ooh and aah over the three dimensional forest that you grow on the board throughout the game. Whilst magpies like me are initially drawn to the shiny production values, there has to be some awesome gameplay under the surface if a game is going to earn its place in an already-crowded collection, so I'm going to talk a bit here about whether or not Photosynthesis sticks around or gets the chop. Okay, sorry, really no more now. As far as gameplay goes, Photosynthesis pretty much does what it says in its title. Players gather light points as the sun shines on their trees, then spend them on growing their colour-coordinated forest: planting seeds, growing young trees or chopping down old ones. 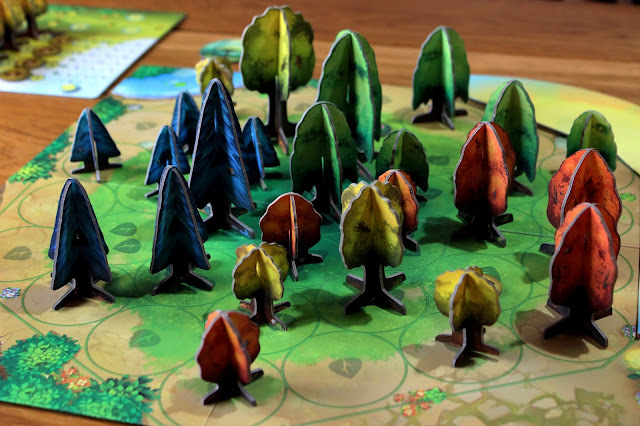 All the while you're vying for position, with the most victory points available for growing trees in the fertile soil at the centre of the board. 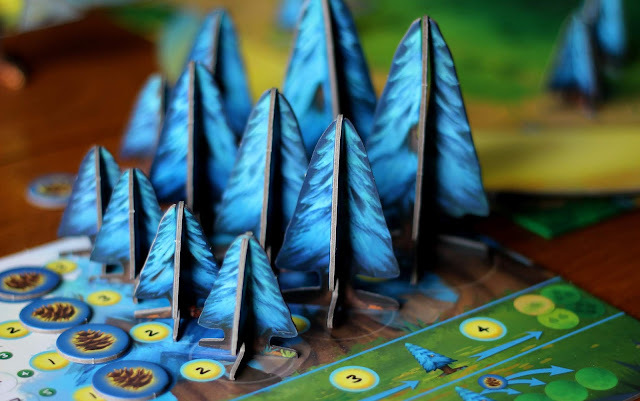 Buy: Before a seed or tree can be used on the board, it needs to be purchased from the tree 'shop' on your player board with the light points indicated. 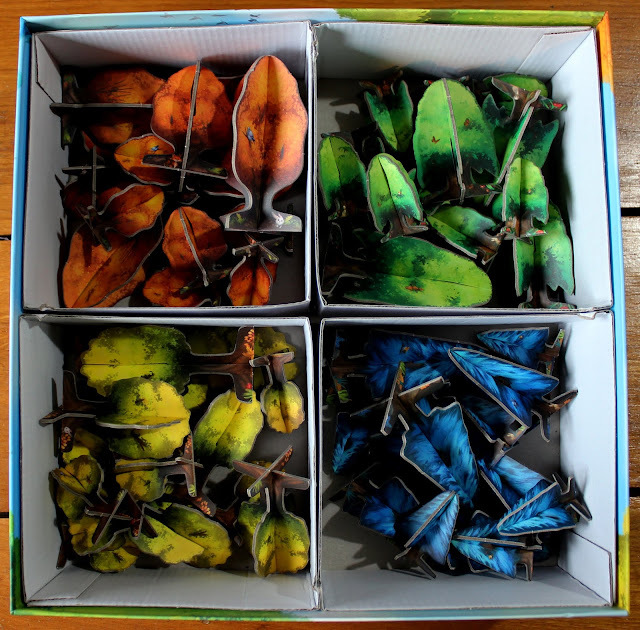 Plant a seed: Any seeds that have previously been purchased can be shed from one of your trees already on the board. Bigger trees can shed seeds further away, which is helpful for reaching the big-point spaces nearer the middle of the forest. Grow a tree: You can pay light points to grow a seed into a small tree, a small tree into a medium tree, or a medium tree into a big tree. 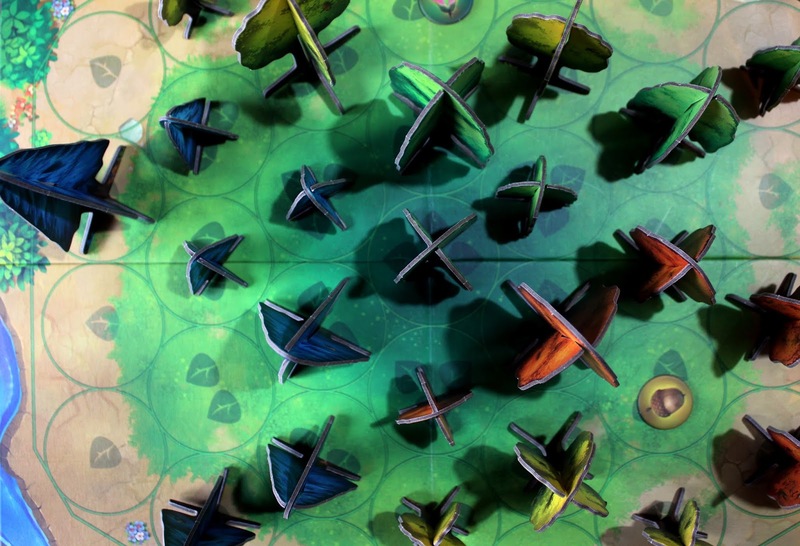 You can only interact with each space once per turn, though, so growing a big tree takes a number of rounds. Collect: This is where victory points are scored; you can pay light points to 'end the life-cycle' of large trees and collect scoring tokens based on the quality of the soil they were grown in. It's a much nicer way of saying 'chop your tree down for points', which is how I've been describing it to people! When the sun completes its third lap, everyone adds up their victory point tokens and any points earned for residual light points; most points wins. As you'll have seen by now, Photosynthesis is clearly eye-catching. Beyond that, though, the theme feels really different to anything else in my collection and the straightforward gameplay feels streamlined and well designed rather than simplistic. It's an enjoyable strategic puzzle to solve, with as much of a take-that element to it as your group chooses to bring. I've played with people who apologise profusely for shading other trees, and with others who find it hilarious to deliberately target their friends - the experience really does depend on the players. The fact that I now refer to this game by the alternative title of 'Mean Trees' might give you a clue as to which side people normally ending up falling, though! There are plenty of decisions to make, and these change focus throughout the game. 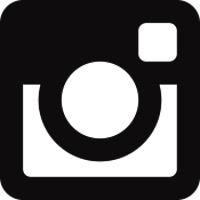 At the start you're balancing whether to plant new seeds or grow existing trees, keeping an eye on the sun's position and everyone else's moves to maximise your light gathering capacity. Towards the end you're deciding whether it's the right time to cut down your trees or whether you need the extra light that the bigger trees gather to keep your forest growing. It sounds like a lot to think about, but feels quite natural when you're playing and makes sure you're invested in everyone else's turn. Sabrina Miramon's artwork is beautiful, with so many sweet little details to spot amongst the roots and branches. 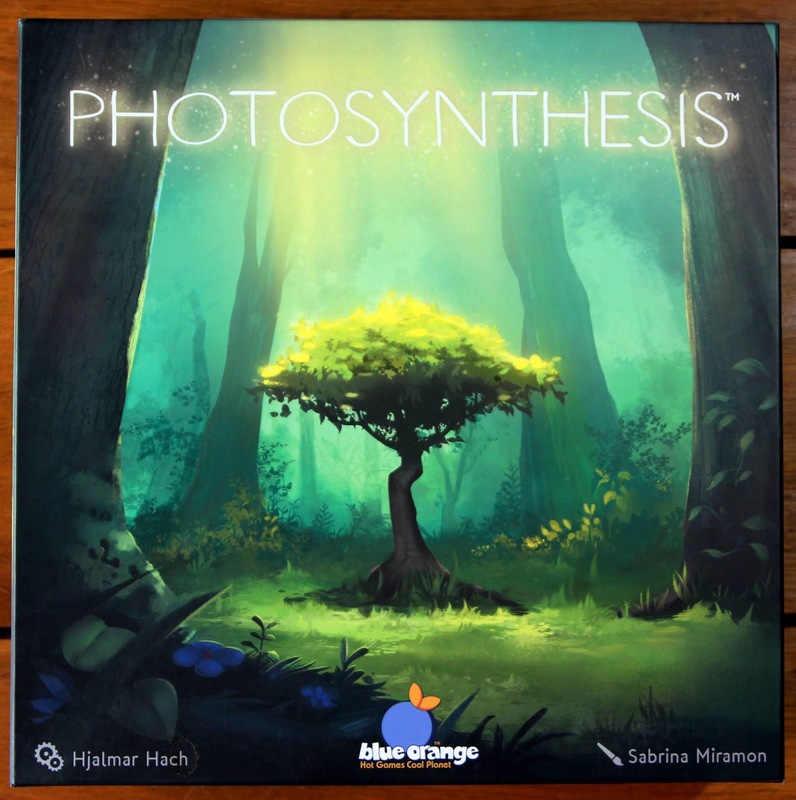 I'm very guilty of judging a game by its box, but Photosynthesis was in no danger of being passed over on that basis. Everything from the shiny tree on the front (yes, I got excited about spot UV, this is what I've become...) to the calming colour scheme adds to the already stand-out look of the game. The iconography is also very clear, with the reference guide on each player's board acting as a great reminder on light point costs throughout the game. The components are great, with everything made from nice chunky cardboard, and the box is just about big enough to store all the trees while still assembled, so this keeps setup time to a minimum - although it takes quite a while to punch everything out in the first place, so allow some time for that on your first play. Photosynthesis is the current holder of my record for 'most rules messed up in a first play', which is completely my fault given how straightforward it is. I think I must've had the rulebook upside-down or something, because it really is very clearly explained and laid out, as well as being reassuringly thin. In my defense, it was very late at night when I read it! There's a great video from Watch It Played to take you through everything, too. So, does it get to stay on the shelf? Whilst I love the theme and the puzzle, I think Photosynthesis will have limited replayablility with less casual gamers. Saying that, it's a definite keeper for the collection because of its brilliance as a game for new players. The theme draws people in really easily and the rules are quick and easy to explain (unless you're me, clearly!). It would also make a fun, lighter alternative to bring out every so often as something different for more experienced gamers.